Traie Vane - "White Beach"
Traie Vane, the “White Strand” or the “White Beach” next to the beauty spot of Niarbyl. 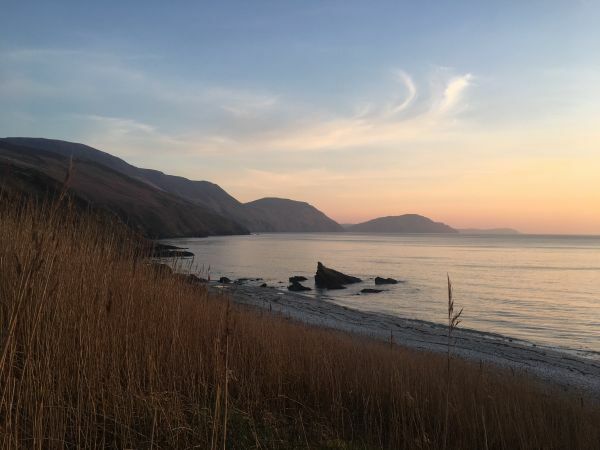 With stunning views back along the south coast and the rocky vista of Niarbyl to the immediate north, this beach is certainly spectacular, none more so than at sunset. However its real selling point is the abundance of small rounded shiny white quartz pebbles which form the basis of the beach. They are said to be the currency used by the underwater mermaid kingdom that is alleged to exist off Niarbyl bay. Whether you believe this or not one cannot deny that their presence make this a truly a white beach! There are several Traie Vanes on the island. There is also a little known beach just to the north of Peel called “White Strand” which is arguably just as nice as this one, so don’t be upset if you get them mixed up! 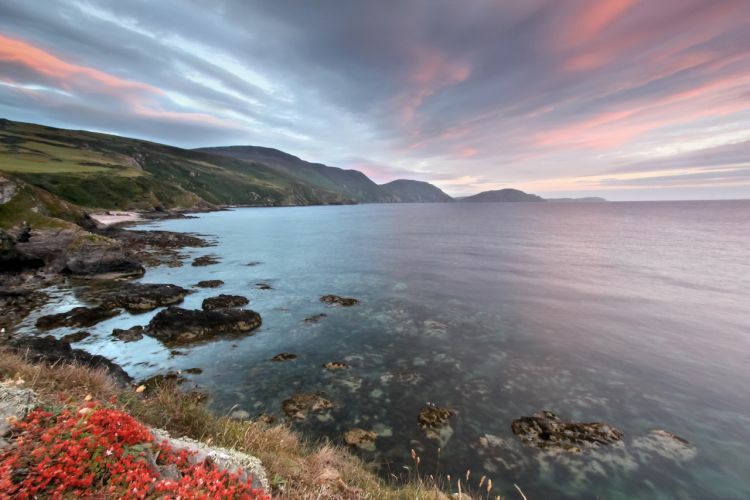 Best time to visit is sunset- truly clear skies and often a good view of the Mourne Mountains in Northern Ireland. How to get there- On the main Peel to Port Erin road take the well signposted turning to the Niarbyl visitors centre. Park there and walk back around the coastal footpath a short way until you come to a large gathering of reeds. Follow the path down and you are now on the white beach. When viewed from the above coastal path this beach almost appears too good to be true. Sheltered from all sides this shingle beach is tucked away barely a mile north of the airport . But as the name suggests, the real beauty here lies in the gorgeous gorge which carries the bubbling Santon burn river into a beautiful deep lagoon at high tide. By paddling up the gorge you are dwarfed by the steep sided rocks alongside you, teeming with different plant species. Lying on the beach lends itself to witnessing an array of seabirds going about their daily business, whilst for plane spotters this beach is sheer heaven; the aircraft drift in along the coast to the nearby airport. Yet despite this aviation activity Santon gorge remains quiet and allows the visitor to experience their own private beach once more. How to get there- Drive to Derbyhaven and follow the coast northwards to the café at the furthest possible point one can drive, next to Ronaldsway airport runway. Then walk northwards, following the coastal path for approximately a mile and half. Santon gorge will become apparent by the river piercing the headland in front of you, literally creating the said gorge. Cornaa is a fine example of a pebble storm beach. Known also as a ‘beach berm,’ countless storms have built this enormous barrier across the bottom of the Cornaa valley and in doing so have partially blocked the river to create a large tidal lagoon at high water. The valley is a gem, beautiful, quiet and secluded rarely found by the average visitor. The Cornaa River tumbles down many waterfalls surrounded by magnificent mixed woodland to reach bluebell-carpeted water meadows set back behind the tidal lagoon. Seemingly untouched it hides in its woods fascinating relics of centuries passed. 18th century Lime kilns can be found just back from the beach and as you walk up into the woods above the meadows you find the mysterious 19th century Bellite factory built by Carl Lamm, it’s reinforced concrete walls now lost in the woods. Bellite, a safer alternative to dynamite was invented by Lamm in 1885. The UK government refused him permission to build in the UK so he came to the Island, with plans for a small port it never was completed, the Manx government with drew support due to fear of explosions. Passing the old factory you soon come to the ‘Blue Lagoon’ formed as the river tumbles over its final waterfall, an inviting swim but beware it’s cold. Retrace your steps from here or you wander into another enchanting part of the glen. How to get there - To get to Cornaa beach take the A2 from Douglas to Ramsey. At Glen Mona, take a sharp right and after about a mile a left onto the Cornaa road. Follow this single track road to the beach bear right just before the ford, park at the beach. Hardened travelers often say the journey is the best part of any trip. This may well be true in the case of the Dhoon beach, however the end destination isn’t bad either! To access this beach requires the steep descent of the Dhoon glen. Which is not exactly a hardship! With its steep streams cascading into waterfalls, endless greenery and variety of trees Dhoon glen tops many people’s charts as their favourite Manx glen. Around halfway down this highly pleasurable ramble, Dhoon beach comes into view. Surrounded by the steep cliffs that make up the lower section of Dhoon Glen, this beach could easily be a part of the Mutiny on the Bounty story. Indeed, such is the location’s beauty it has been used as a prominent film location in the past. 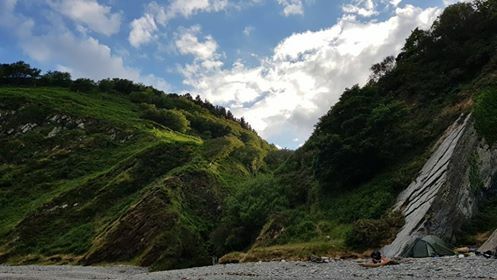 By continuing down the steep Glen you eventually reach the beach and are rewarded by a small but sheltered shingle shoreline, dwarfed by the massive cliffs surrounding it. By taking in the full panorama one appreciates the ascetic pleasure of the place and once more the words “Pacific island” most readily come to mind. It is easy to get lost on this beach and spend the afternoon here whiling away the afternoon. Even by Manx standards the beach is well hidden, and as such, also had a rich smuggling history. Pack horses were dispatched through the treacherous glen at the dead of night to bring the contraband to Laxey and Douglas and you can sense the mischief as you start the steep climb back up through the glen. But again, it’s hardly a hardship with the view surrounding you! The north western coast of the island provides a different landscape to the hidden coves found elsewhere on the island. The coast from Glen Mooar, north of Peel round to Ramsey is a continuous beach offering remoteness and isolation and can be accessed at many points. If you are visiting this stretch of coastline at low tide it is well worth stopping off at Jurby Head. Miles and miles of sandy cliffs and beachscape await you, but there is also a hidden surprise. On 3 December 1931, whilst making passage back to Fleetwood from fishing grounds off the north west coast of Ireland, the large steam trawler and former mine sweeper Pasages encountered a severe south-westerly gale. At 06:00hrs, in pitch darkness, Pasages grounded on the beach below St. Patrick's Church, Jurby. Given the plight affecting Pasages, her skipper decided to send up distress flares which were in turn seen in Ramsey resulting in the Coastguard initiating a rescue attempt. With lifeboats from Peel and Ramsey unable to get close all 13 crew members were saved by a rocket line breeches buoy rescue from the shore. 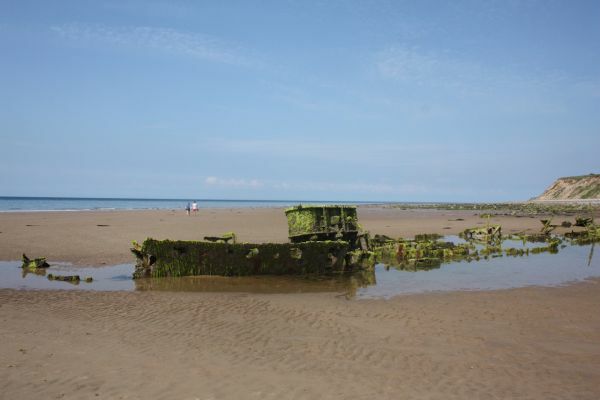 Following the grounding of Pasages, due to continued adverse weather, the wreck was unable to be salvaged and today, nearly 90 years later the wreck is still very evident on the beach and well worth a look. How to get there- This is only accessible at low tide, so be sure to check the times before you go. From St Patrick's Church, Jurby take the first left heading north, park by the water treatment area and walk south along the beach for about 600m. Despite this rather dramatic translation from Gaelic, Mouth of the Devil, this beach certainly has nothing fearful about it. An old hidden smugglers cove hidden by lush vegetation on the inland side and protruding cliffs on the seaward side, this beach is steeped in history. Shipwrecks and clandestine smuggling operations all feature heavily here and as one noses around the numerous caves you can almost smell the contraband liquor in the air! As much as the history of the area is fascinating one thing stands alone at this beach, the feeling of being cocooned in one’s own private oasis. The lush vegetation on the approach has an almost Caribbean feel to it, and certainly adds to the feeling of invisibility, whilst the natural outcropping of rocks hides the visitor’s presence furthermore. The mix of sloppy sand and white shingle allows for ample lounging, whilst its location on the west coast means it’s yet another spectacular location for sunsets. But it’s the sense of being hidden that wins here and who knows, you may even find a case of 300 year old Port if you look hard enough!